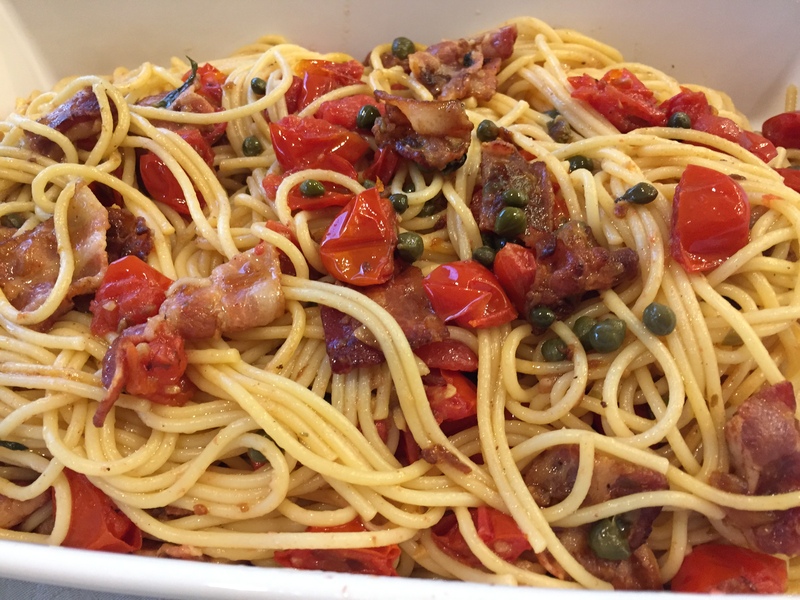 On a day when you’d like to prepare a quick pasta dish that will impress your guests, reach for this recipe. All you have to do is put all the pesto ingredients in a food processor (in the correct order) and pulse until ready. You can either serve the pesto with pasta alone or sauté some shrimp and add it to the pesto and pasta. Divine! *Note-In the videos I list the wrong order of the ingredients. Pay attention to the recipe that’s inserted below. The written version is correct. Heat oven 350F. Toast walnuts for 10 minutes. 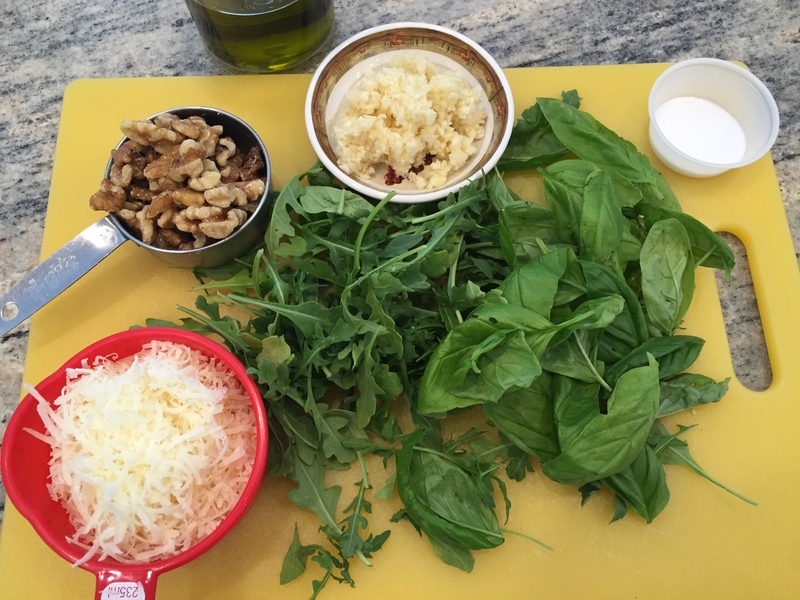 In a bowl of a food processor, add walnuts, arugula, basil and garlic Process 1 minute. Gradually add oil and process until fully incorporated. Add cheese and salt process until blended. The pesto sauce can be refrigerated for up to one week or frozen up to three months. Pasta and Shrimp: Cook pasta following package directions, reserving 1/4 to 1/2 cup of the cooking water. Season shrimp with salt. Heat olive oil in a large non-stick skillet. Saute shrimp for a couple of minutes. Turn and saute the other side. Toss drained pasta with the reserved pesto (you might only use half of the pesto and freeze the other half, depending on the number of guests) and the reserved pasta water, if necessary. Stir in shrimp and enjoy! Quando você quizer fazer uma massa rapida para impressionar os convidados, escolha esta receita. Basta colocar os ingredientes num processador de alimentos (na ordem certa) e o resultado é um molho pesto muito chique e saboroso. Você pode servir com o macarrão puro ou fritar uns camarões e misturar com o molho e o macarrão. Não precisa de mais nada…a não ser um bom vinho. *Obs.- Quando gravei os videos eu errei a ordem dos ingredientes. Preste atenção nas instruções corretas inseridas abaixo. Aqueça o forno 350F. Coloque as nozes no forno para tostar. Eu costumava queimar as nozes por não prestar atenção. Agora eu fico do lado do forno durante os dez minutos para vigiar elas. Deixe as nozes esfriarem. Coloque as nozes, a rucola, o manjericão e o alho na tigela de um processador de alimentos. Processe por um minuto. Adicione o azeite lentamente até incorporar. Acrescente o queijo e o sal e processe até ficar com a consistência de pesto. O molho pode ficar na geladeira por alguns dias ou ser congelado por até três meses. Massa com Camarão: Cozinhe o macarrão de acordo com as instruções no pacote. Reserve meio copo da água em que se ferveu o macarrão. Tempere o camarão com sal. Esquente o azeite numa tacha. Frite o camarão de um lado por alguns minutos. Vire e frite o outro lado. Misture a pasta com o pesto e a água da fervura. Adicione o camarão e sirva. The May issue of Food & Wine is fantastic! The title is “Cook Like a World Traveler”. Below we travel to the Amalfi Coast for some pasta. 1. In a large saucepan of salted boiling water, cook the spaghetti until al dente. Reserve 1/2 cup of the cooking water, then drain the pasta. 2. Meanwhile, in a large nonstick skillet, heat the 1 tablespoon of olive oil. Add the onion and cook over moderate heat, stirring occasionally, until starting to soften, about 4 minutes. Add the bacon and cook, stirring occasionally, until the bacon and onion are browned, about 5 minutes. Stir in the garlic and cook until fragrant, about 30 seconds. Add the tomatoes and a generous pinch of salt and simmer over moderately low heat, stirring occasionally, until the tomatoes start to soften, about 6 minutes. Stir in the capers and mint and season with salt and pepper. 3. Add the pasta and the reserved cooking water to the tomato sauce and toss over moderate heat for 1 minute. Season with salt and pepper, drizzle with oil and serve, passing cheese at the table. Chegou a revista Food & Wine, edição do mês de maio. A edição mostra receitas do mundo enteiro. Eu fui logo para para a Costa Amalfitana da Italia, o destino mais romântico do país. 1. Cozinhe o macarrão numa panela grande com agua salgada até der o ponto al dente. Reserve um copo da agua em que se ferveu o macarrão. 2. Enquanto isso, esquente uma colher de sopa de azeite de oliva. Acrescente a cebola e cozinhe durante4 minutos no fogo médio, mexendo de vez em quando. Cozinhe até a cebola começar a amoleçer. Adicione o bacon e cozinhe até o bacon e a cebola ficarem corados. Acrescente o alho e cozinhe por uns 30 segundos. Adicione os tomates e uma pitada grande de sal. Cozinhe no fogo baixo, misturando de vez em quando, até os tomates amoleçerem. Acrescente as alcaparras e tempere com sal. 3. Adicione a pasta e a água que foi reservada e misture no fogo médio por dois minutos. Jogue o azeite e o queijo por cima. The summers I spent in Brazil were some of the best times of my life. Small-town living is good for the heart, the mind, the soul and the stomach. I had a routine. Early in the morning I’d wake up and and have real coffee, made with a cloth coffee strainer and water that had been boiled on the stove. There was fresh bread on the table thanks to the person who woke up even earlier than myself to buy the bread, usually a young housekeeper. She could find the bread money in a tin set on top of my grandmother’s fridge. After a filling breakfast of bread, cheese, fruits and all sorts of yummy cookies and crackers I’d set off to the local market. I forgot to mention cheese bread. The mayor’s wife sold cheese bread from the front door of their home. In the morning there were people lined up for her bread. My life’s goal at that time was to get my hands on the recipe. No such luck. She’s still alive so i’m hopeful. One thing I remember is that there were barely any leftovers after breakfast…and sometimes, if you woke up too late…there was no bread left. Pão de Sal. (Salt bread) Basically a baguette. The street market was a place where people set up their make-shift tents to sell all sorts of fruits and vegetables. I never really liked the meat market section. A little too bloody for my taste. But the fruits, vegetables, cheeses and sweets. Ohhhhh…so beautiful. In case you’ve never seen a real fruit or vegetable, grown on a small farm or family garden, they do have flaws. They aren’t perfectly round or shiny. They sometimes still have dirt on them. Crazy concept, isn’t it? After an hour or two at the market, I’d walk back to my grandmother’s house and make a few stops along the way to say hello to people standing at their doorsteps in the high-noon heat. One of those passes was my boyfriend’s house. His mom was a social butterfly and loved to talk. Beads of sweat formed on my forehead and a trickle of sweat ran down my back. The streets, normally bustling with bicycles, cars, and motorcycles between 8 a.m. and noon, became deathly quiet at lunchtime. The town’s residents were home having lunch. Then came the siesta. A good book in my hand and the rattle of the ceiling fan initiated the siesta process. Sometimes, while everyone, including the dogs, slept (I’ve never been much of a sleeper), I stood in the kitchen and baked. Yes, at 15 I was already fascinated with the kitchen. I credit my Brazilian friends and family for first introducing me to good food. While they were belly up and snoring in the hot and arid heat, I was in the kitchen, usually chatting with the housekeeper. She’d watch me as if I were from outer space, kind of admiring me. Our clothes were different than theirs. (I thought I was tacky) Being an “American” was a big deal back then. I was often asked to say things in English or translate songs. People asked about my clothes. They loved jean jackets and Nike sneakers. A few hours later it was time for afternoon coffee. Brazilian’s call it the “lanche”. More coffee, more bread. There was always a cooler full of beer in the kitchen. The fridge was too small to fit beers and they didn’t got cold enough like they could in a cooler. Brazilians like their beer ice cold. If you want to make a Brazilian happy, offer him a bottle of beer that’s coated with an opaque frost. Soap operas began around six, just as the sun began to hide beneath the horizon. No one left the house for a drive around town or a stroll through the town center until the last soap opera of the evening had aired. Nights were fun. Beers at the “Cais”, luaus on the beach, themed parties at the social club, ranch parties. The walk down the “cais” was my favorite. The word cais means boardwalk or dock. Sunrises on the cais were unforgettable. All this reminiscing and I forgot why I began this blog entry. Oh, yes. 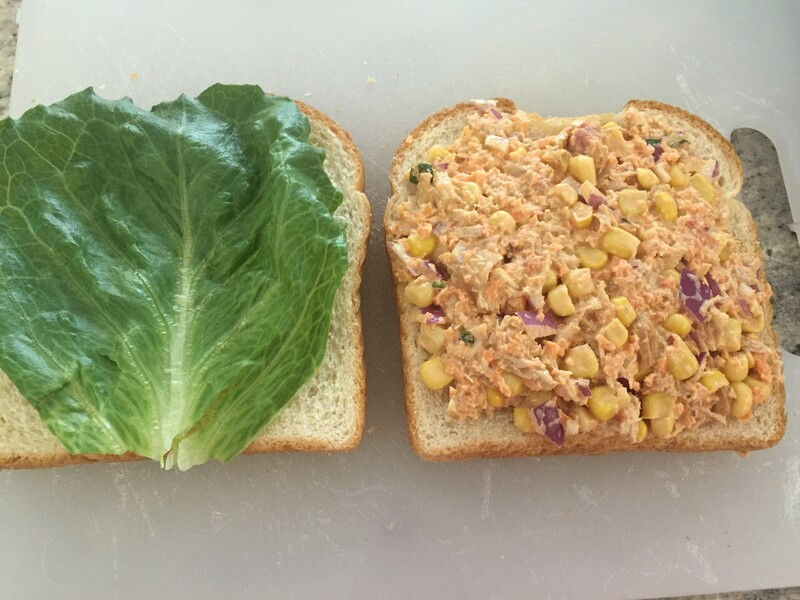 The sanduiche natural or natural sandwich. Manoel, my boyfriend at the time introduced me to the sanduiche natural when we were at the beach. He called over a street vendor and bought one for me. It was such a fresh tasting sandwich. I am happy that I was able to replicate the taste with the recipe you see below. We can replicate, reproduce and re-experience many things in life. There are others that will only leave memories. Manoel and I had plans to meet again just as we had many times over the years. He left this world too soon and with him took that beautiful smile and warm hug that will never be replicated. 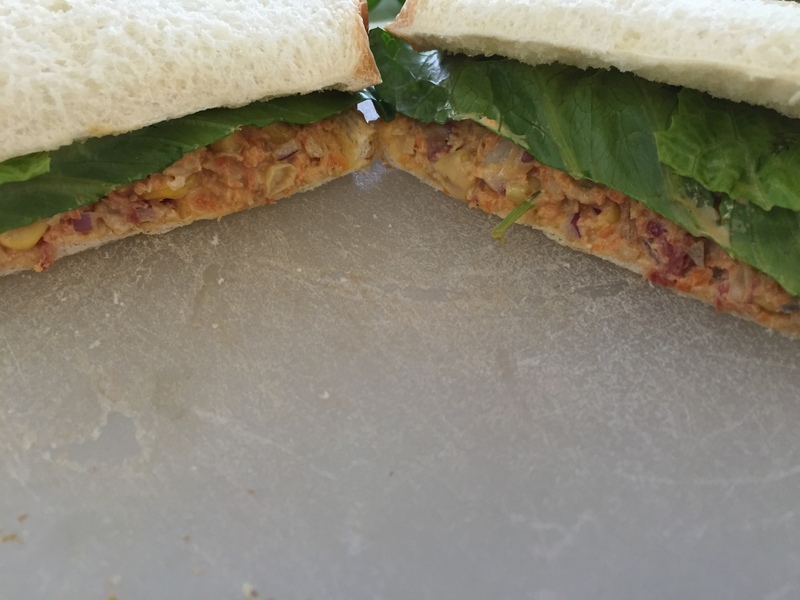 Maybe this blog entry wasn’t about the natural sandwich, after all. In a bowl stir together all the ingredientes except the bread and romaine lettuce. Spread the mixture on a slice of bread. Top with tomato slices and romaine lettuce and another slice of bread. Lembro muito das melhores épocas de minha vida quando eu passava as férias no Brasil. Provei o meu primeiro sanduiche natural na praia de Januária. O vendedor gordinho carregava um isopor com alça no ombro. Ele veio em nossa direção. Com aquele sorriso carinhoso o Manoel comprou o sanduiche e me ofereceu. O sabor do sanduiche era tão perfeito. Os ingredientes combinavam tão bem. Quase tão bem como eu e o Manoel combinavamos. Fiquei com aquela lembrança na memoria para sempre. Passaram muitos anos e foram muitas férias em Januária. Lembro do Manoel e de nosso ultimo encontro. Ele usava uma calça jeans, camisa azul e botas. Estavamos na porta do escritório dele. Recebi um abraço forte. Me senti feliz e protegida. Misture todos os ingredientes exceto o pão e a alface numa tigela. Passe o recheio numa fatia de pão de fôrma. Forre com tomate e alface e a outra fatia de pão. Things don’t always turn out the way we expect. Sometimes the outcome is better than we hoped. 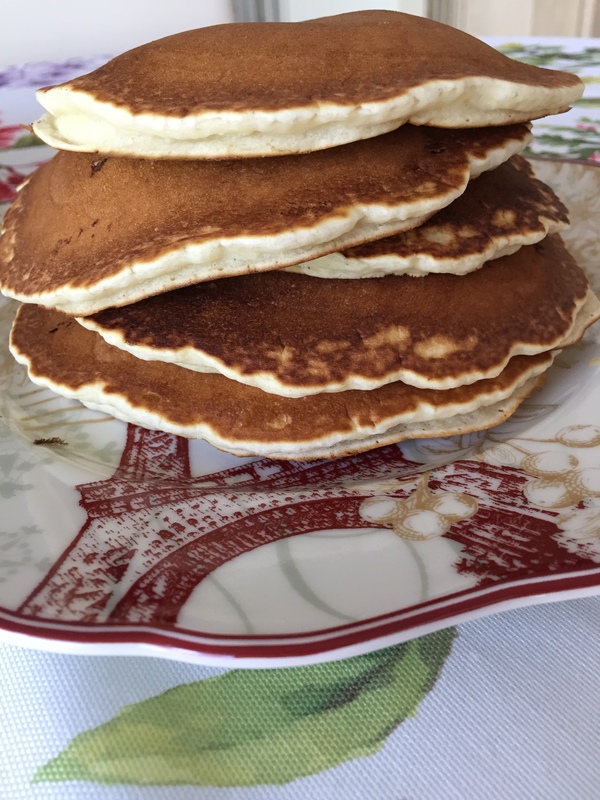 I made these pancakes on Mother’s Day morning, along with a few other tasty treats. Milk was the missing ingredient…but we had plenty of Half & Half in the fridge. 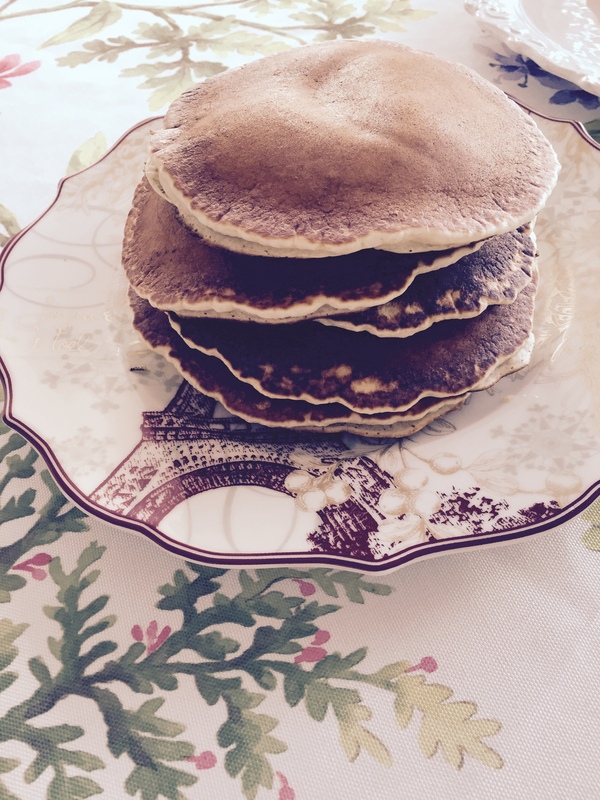 You wouldn’t believe how lovely these hot cakes turned out sans the milk. I added more Half & Half than the recipe called for milk. This is because milk is more watery. 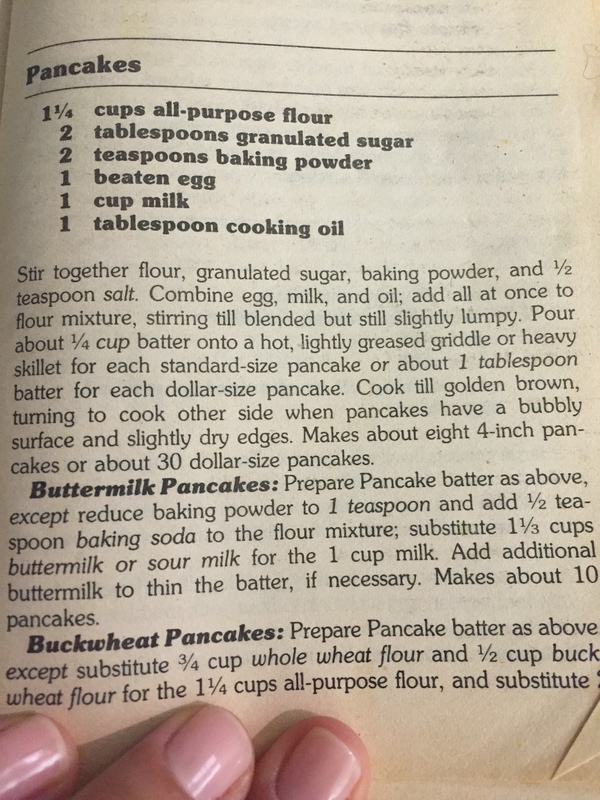 The recipe for these pancakes can also be found several posts back. Try the search button. We are thankful for the health of our parents and thankful to have spent a nice Mother’s Day in their company. As coisas nem sempre acontecem como nós esperamos. As vezes o resultado é melhor ainda! Fiz estas panquecas no Dia das Mães. Faltou leite mas usei Half & Half, uma mistura de leite e creme. O resultado foi mais do que bom. A receita para as panquecas tambem se econtra neste mesmo blog…procure usando a opção de pesquisa. Somos abençoados por ter os nossos pais e por podermos ter passado um Dia das Mães junto a eles. Strawberries abound this time of year. When it’s hot outside you want something that will cool the palate. This Strawberry Mousse is light yet rich and the lime zest gives the strawberry salad a touch of tang. 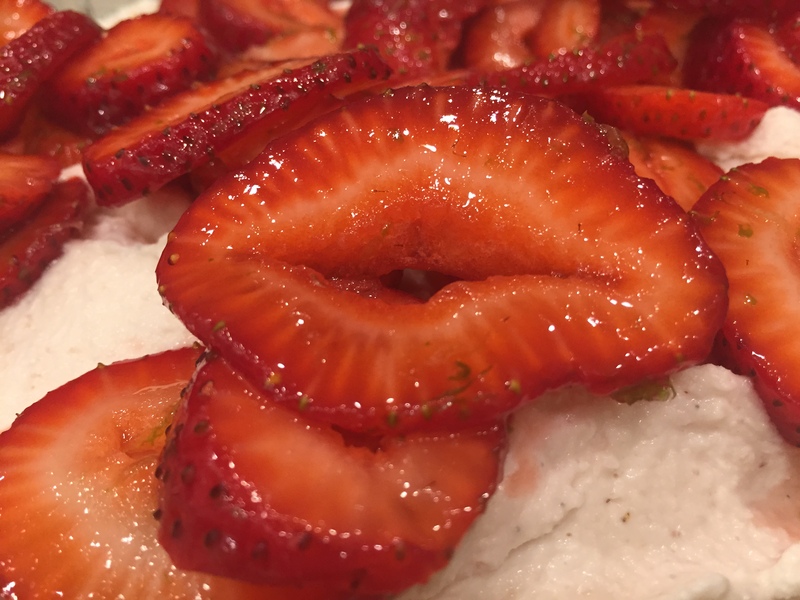 The neatest thing happened when I spooned the strawberries over the mousse. I only noticed it after I snapped a few photos and viewed them. A strawberry slice stands out in the form of red juicy lips. 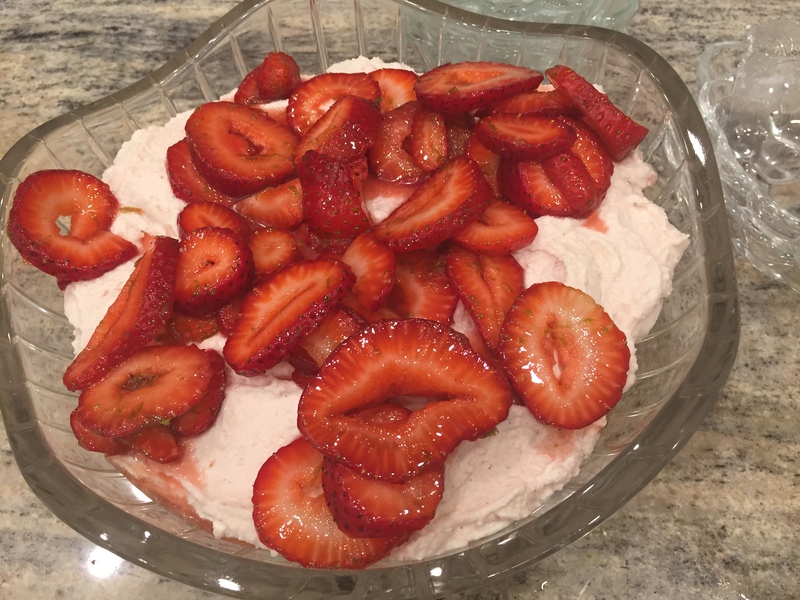 Strawberry Mousse: In a food processor, puree the strawberries until smooth; you should have 1 cup. Scrape the puree into a bowl. In a small bowl, sprinkle the gelatin over 1/4 cup of the cream and let stand for 5 minutes. In a small saucepan, stir 1/4 cup of the cream with the sugar over moderate heat until the sugar dissolves. Whisk in the gelatin mixture until dissolved; remove from the heat. In a large bowl, combine the mascarpone and vanilla seeds. Using a handheld electric mixer, beat the mascarpone at medium speed until thickened, about 3 minutes. With the mixer on, slowly drizzle in the gelatin mixture and beat for 1 minute. Fold in the strawberry puree. In a large bowl, beat the remaining 1 1/2 cups of heavy cream at medium speed until stiff peaks form. Fold the whipped cream into the mousse and spoon into bowls. Refrigerate until well chilled, at least 1 hour. Strawberry Salad: In a medium bowl, toss the strawberries with the sugar and lime zest. Let macerate at room temperature for 20 minutes. Spoon the strawberry salad and juices over the mousse and serve. Mousse de Morango: Bata os morangos num processador até virar um purê. Coloque numa tigela. Em uma tigela pequena coloque o creme e despeje a gelatina em pó sobre o creme. Deixe durante 5 minutos. Numa panela pequena misture ¼ de um copo de creme com o açucar até o açucar dissolver. Tire do fogo. Numa tigela grande misture o queijo mascarpone e as sementes de baunilia. Use a batedeira para bater o mascarpone na velocidade média. A mistura deve render 1 copo de queijo. Mantenha a batedeira ligada e lentamente despeje a mistura da gelatina no queijo. Bata por um minuto. Desligue a batedeira e levemente acrescente o puree de morangos. Numa tigela grande bata o restante do creme (1 copo e meio) em velocidade média até der o ponto de chantilly. Despeje o chantilly no mousse e misture levemente. Divida em copinhos de sobremesa. Leve para a geladeira por algumas horas. Salada de morangos: Numa tigela de tamanho médio, misture os morangos com o açucar e limão e deixe descansar em temperatura ambiente por 20 minutos. Jogue por cima do mousse e sirva.